Home / Weddings / Wedding Stationery / Name Place Cards / Bicycle Table number Holder, Name Placement, Wedding Table centerpiece. Bicycle Table number Holder, Name Placement, Wedding Table centerpiece. The bicycles stand at six inches long and with the stem around six inches high. I have known that some customers purchase these bicycles and spry paint them themselves as they know exactly what co;lour scheme they want for their wedding. The bicycles make perfect table number holders and can easily hold an A5 card. They also make perfect name placements and can double up as wedding favors. I’ve used the bicycles as Christmas tree decorations, table name placements and indeed I have my business card placed in the loop on my desk which makes a decorative addition to the office. 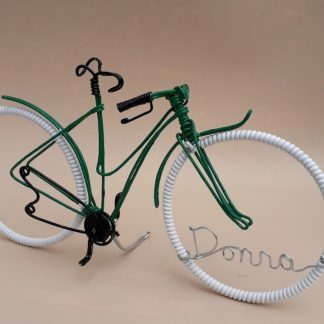 Bicycle Cake Topper, Ladies Green Pushbike, Mothers Day Gift.